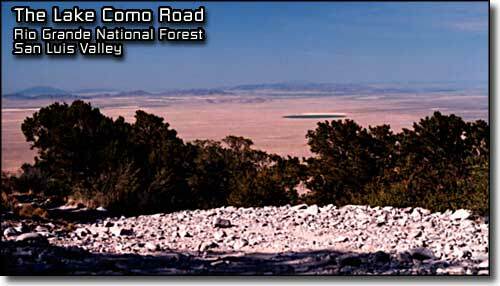 The Lake Como Road is known nationally as one of the roughest four wheel drive roads in America. It lives up to its' reputation well. We parked very close to the bottom of the hill, just inside the treeline. 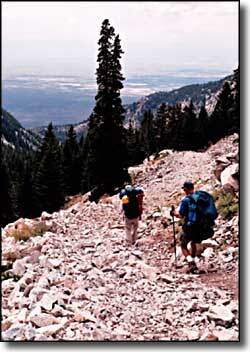 We were probably 2 miles below where the trailhead oficially is. That's all right, the road went for a dump long before the trailhead and just got worse as we went. There were a lot of switchbacks in the beginning as the material alternated among dirt, cobblestones, ball bearings, and just plain rock. Slowly, as we trudged up the hill, the trees got larger. We started at 8:00 am but it was hot early. The views out over the San Luis Valley just got larger as we went. The hillside just above the trailhead marker is where the road finally began to go back into the mountain. Still, there were lots of switchbacks. Once upon a time there was a gold mine at the very base of Blanca Peak, above Lake Como. 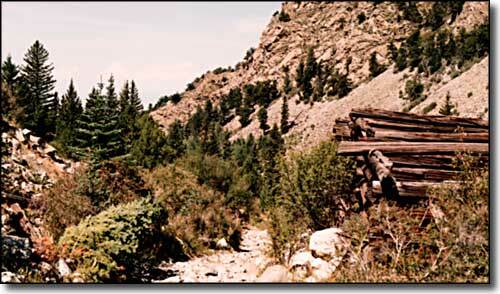 The mine wasn't productive enough to warrant building an ore mill on-site so the miners freighted the ore out to Blanca in the valley on mule-drawn wagons. This road was made by and for those wagons. Just below the worst of the rock obstructions in the road, the miners built a kind of half-way camp and called it "Columbine". We were about 4 miles into the hike when we crossed the ridge out of Chokecherry Canyon and began the descent into Holbrook Canyon. This was a pretty forested area leading back into the mountain. After a bit we came to the remains of Columbine. We crossed a few more good rock barriers and then crossed Holbrook Creek. Here is where the road got serious. There was much less dirt and many more cobblestones. 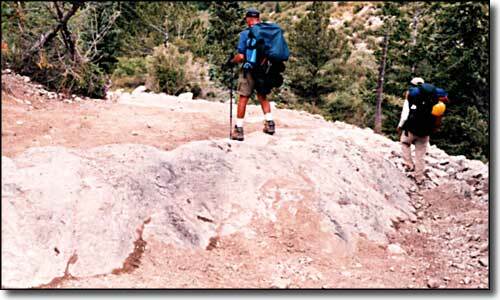 There were also many ribs of granite crossing the road and lots of large holes. I don't know if I fell asleep walking or what but suddenly we were at the lake. I remember cobblestone after rock after cobblestone and then mud. Lake Como is in a beautiful place. 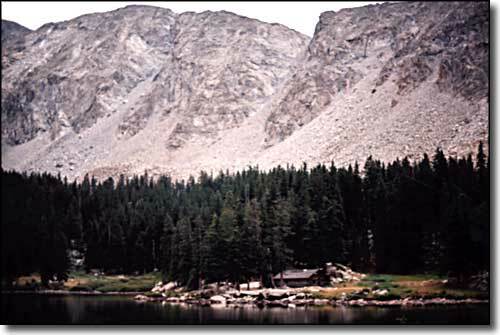 There were also lots of old cabin remains around the lake (what remains of the town of "Commodore") and part way up the hill above the lake toward Blanca Peak. The road continues on past the lake for maybe another mile and ends in a bowl next to the Blue Lakes. We started out at 8:00 am and arrived in camp at 12:30 pm. I sat down for a minute, took my pack off and then realized it was almost 4. We hiked about 7 miles carrying 50+ lbs. on our backs. I think we earned the rest of the day off. From the east end of the lake, the jeep trail heads up the hill above treeline and dead ends at the Blue Lakes. Just short of treeline, a trail heads down and to the right and then up onto a boulderfield that leads into the first chute of the climb to Little Bear. Just above Blue Lakes and to the north (left of the main trail) is the ridge leading up the western side of Ellingwood Point. To the south along here is the main route to the northwest face of Little Bear (don't hurt your neck staring up at the cliff here). Straight ahead on the trail leads to Crater Lake and the ruins of the old gold mine, and then on up the hill to Blanca Peak.